Hiking the Inca Trail was both incredibly challenging and amazingly rewarding. In some ways it was easier than expected, and in others it was far more difficult than I could have imagined. All of the challenges were worth it for that moment that Machu Picchu slowly came into view from afar. I booked my reservation with Peru Treks ages ago - spots on the trail are limited and sell out months in advance, even during the shoulder seasons (September is just at the end of the dry season and the beginning of the rainy season). I made sure to arrive in Cusco a few days before the trip to adjust to the altitude and check in with Peru Treks to pay my balance and get any last minute information about the hike. I highly, highly recommend arriving to Cusco early if you can. You'll find out pretty quickly how the altitude affects you - if you need medication or if a few good nights sleep and some coca tea will be enough. Luckily, after a couple of days of feeling tired and somewhat headachy, I was well-enough adjusted. A walking tour around town and a climb to the Saqsayhuaman ruins and the white Jesus atop Cusco were a good way to warm up my lungs to the thin air. The view of Cusco from the Jesus statue. We set out for the Inca Trail just after 6am on the morning of the 27th. I hardly slept the night before - waking up every other hour anxiously afraid I would oversleep. We stopped in Ollantaytambo for a quick breakfast, and the various members of the group slowly started introducing ourselves, before loading back up onto the bus for a very bumpy ride to Piscacucho, where we would start our trek (imagine riding in a small bus down an unpaved road about the same width as the bus itself). We unloaded and those of us who had rented sleeping bags and needed mats received them. And a wave of fear and panic hit me. I'm not exactly known for packing well for these sorts of camping ventures, but I thought I had done pretty well. (I hadn't, really, at all.) Also being a cheapskate on a RTW budget, I hadn't hired a personal porter for the trek. I have a nice, lightweight, mummy-style sleeping bag at home. A nice, extra-light, inflatable, extra-long Thermarest mat. The ones we received resembled more closely the sleeping bags you use as a kid. Huge. Rectangular. Heavy. Even in a stuff sack, I barely fit it into the entire bottom section of my enormous 60L bag (no, it was not filled to capacity), and it weighed roughly 3 kilos (or 6.6 pounds). The mat wasn't any better - thin, heavy, and rock hard. Suddenly my pack was ridiculously heavy. The guide assured me I could hire a porter for the second (and much more difficult) day, but I was on my own for day 1. Luckily, the first day was full of jaw-dropping views to distract me (from the river valley to the Llactapata ruins to the snow-capped mountains), as well as a relatively flat path and plenty of rest stops for those of us still getting adjusted. Day one was also when we learned just how phenomenal the food would be for this trek - I'm still so impressed by all the dishes they managed to create for us! Unfortunately, that was also the one day I chose to wear shorts (and clearly did not put on enough bug spray), so the mosquitoes had an absolute feast of my legs. I wore pants the rest of the trek! Once we finally reached camp I barely stayed awake until dinner, then collapsed around 8pm. The entire Peru Treks group, ready to depart! Unfortunately the uncomfortable mat came back to haunt me, and I didn't sleep very well. I awoke sore, tired, and grumpy the next morning. But my luck changed when I found out the guide had secured a porter that could carry nearly all the contents of my pack! I unloaded the sleeping bag, mat, nearly all my toiletries, and just about anything else that I might not immediately need while walking that wasn't valuable. I can't even tell you how much this improved not only my ability to physically walk the trail, but my spirits as well. Pack light people!! Or just hire a porter up front!! Despite the vast majority of day two being straight uphill towards Dead Woman's Pass, I actually felt really good. I didn't keep my camera out much, but the first part of the trail felt like walking through the jungle - lush greenery, waterfalls, moss, and ancient stone steps. We enjoyed a second breakfast at Llulluchapampa (a campsite with amazing views of the valley below and the rest of the path up) of popcorn, hot chocolate, cheese sandwiches, and crackers before making the final steep uphill push to the top of Dead Woman's Pass, the highest point on the trail at 4215 meters (13,776 feet). After a nice, long break to regroup and cheer on the remaining group members making their way up, we began the steep descent through a misty rain and fog to our campsite and a very welcome lunch that included the Peruvian specialty lomo saltado. Our walking done for the day, we enjoyed a siesta (mostly napping, reading, and journaling in our tents through the rain) before another delicious dinner and another early bedtime. At the top of Dead Woman's Pass on Day 2. Sleep was again not my best of friends, and given the rain and freezing weather (our highest campsite by altitude, the temperatures dropped significantly at night), I hardly slept at all. Thankfully, I was able to hire another porter for our third day, but spent much of the morning in a sleep-deprived, head-cold daze. Our very first hike was again straight uphill, but with a brief stop to visit the Runkuracay ruins - a small set of rooms where messengers were posted along the trail. After finishing the steep climb, we continued back down the other side, stopping to explore the intricate Sayachmara ruins before lunch. This set of ruins included a small number of terraces and rooms, aqueducts, and a large rock in the middle that likely served as a place of worship and sacrifice. By lunch I was feeling full-blown feverish, but between the incredible food and amazing people on the trek (who brought me Emergen-C and Tylenol), I felt much better the second half of the day. It certainly helped that we had a nice rolling flat section and a downhill section, that the scenery was mind-blowingly gorgeous and the temperatures warmer as well! We enjoyed incredible views of the valleys below, and the plantlife along the path was unreal - it looked like it belonged under the sea. Veronica and daughter Rebecca stop to enjoy the incredible scenery on Day 3. The third and final pass treated us to a stunning panorama and blue skies, and then we were off to begin the downhill portion of the trek, including steep, winding staircases that would lead us pass two more sets of ruins before reaching camp. We made a brief stop at Phuyupatamarca, and since we made such a good pace on the trek, had plenty of time to explore the massive Winaywayna ruins, located a few minutes from our final campsite. These ruins had dozens upon dozens of terraces, with a network of rooms at the top, and a cluster of peak-roofed buildings closer to the middle and base of the site. AND, llamas. The government keeps a number of llamas at the various ruins, and there was an entire family just hanging out at the lowest terrace. Absolutely adorable, and yes, we chased them around to take photos with them. 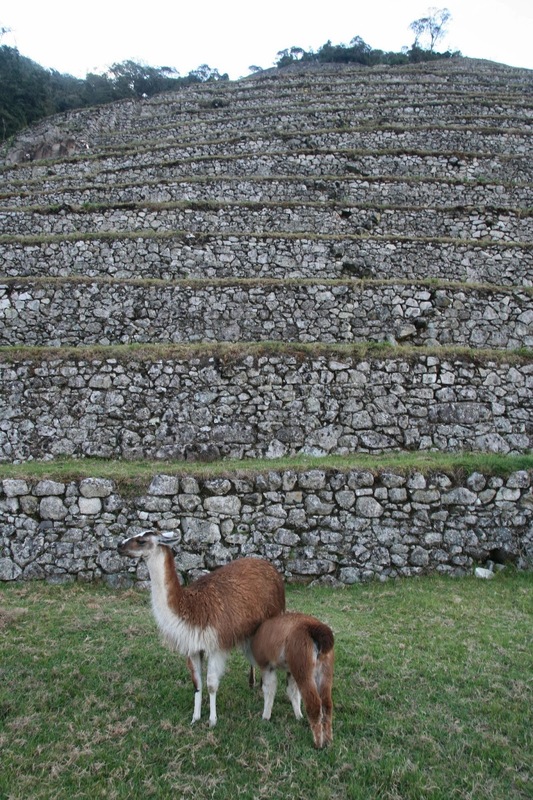 Mama and baby llama at the Winaywayna ruins. Our final dinner that night was bittersweet as we bid farewell to our porters and incredible cook. We were absolutely astonished that he even baked a birthday cake for Lynsey, one of the gals on the trek (and another gap-year RTW traveler) who was celebrating her 30th. That last campsite allowed us beautiful valley views, and between the warmer temperatures and feeling a bit better, I actually managed to get some sleep that night, even with a 3:30am wake up call! Groups typically arise that early to allow the porters plenty of time to get all the gear loaded up and sprint down to their train back to Cusco (that departs at 5am), as well as to get to the Sun Gate and Machu Picchu as early as possible. We queued up at the final passport control checkpoint (which opens at 5:30am), and then hiked at a full-on sprint to the Sun Gate, which wasn't nearly as flat and downhill as our guide had promised! We actually had to scramble up a steep, narrow staircase using our hands at one point. And once we made it there, the valley was sadly covered in a thick fog from the downpour we had gotten overnight. We made a brief stop to regroup and continued on towards our destination. Not long after we had left the Sun Gate however, the clouds and fog briefly lifted, revealing the stunning beauty and magnitude that is Machu Picchu. We were awestruck - the moment it came into view was absolutely magical. When we reached the classic photo opp, it was still a bit foggy (Huayana Picchu was obscured for the most part, and occasionally so was the entire site), but it was still incredible. The first siting of Machu Picchu from the trail on Day 4. Over the next few hours, the fog lifted and the sun shone brightly as we explored the ruins with our guide. Once the tour was complete, we wandering around on our own for a bit before our exhaustion caught up to us and the throngs of tourists became too much to handle. We headed back to Aguas Calientes to check into our respective hotels (for those of us staying the night), and regroup for a final lunch with the entire group and our guides. We were situated right in front of the train tracks, with a great view of the touristy area of town, which allowed for fantastic people watching - we wound up staying there long after lunch was over, enjoying each other's company over Cusqueñas and Pisco Sours until it was time for most of the group to catch their train back to Cusco. Five of us stuck around, determined to check out a local festival celebrating the anniversary of the discovery of Machu Picchu and the tourism industry (despite having still been up since 3:30am!). The festival took place in town squares and the local soccer stadium, with processions winding through the city streets. We saw marching bands, dozens of costumes, performers, carnival games, and of course… plenty of street food. It was such a unique experience - we were incredibly lucky to have been there for it! We finally went back to our respective hotels to crash (I'm still astounded we made it until that evening), but the party apparently continued well into the morning, complete with fireworks - finally in a comfortable bed, I slept right through all of it! The anniversary festival in Aguas Calientes. We awoke the next morning to pouring rain, but decided to hope for the best and head back towards Machu Picchu in hopes of climbing Huayana Picchu anyway. Somehow our groups all had the same timing, and we met at the bus station completely by accident. Those of us remaining - Laure & Q, Christina & Matthew, and myself - piled onto the bus and headed towards the site as the rain started to clear. We made it through the entrance and all the way over to the separate Huayana Picchu entrance with about 15 minutes to spare on our entry window (tickets to Huayana Picchu are limited, and visitors can only enter during their designated window of time - I highly recommend the earliest one, 7-8am, if you can!). While climbing the steep, windy steps to the top was a challenge, it was exponentially easier for all of us without the burdens of our packs! We took a leisurely pace to the top, and I was shocked to see another set of ruins at the pinnacle. We spent the next few hours exploring the various terraces and levels of the mountain, working our way up and around, enjoying the phenomenal views of Machu Picchu and taking plenty of photos. Machu Picchu from atop Huayana Picchu. We finally started winding our way down, reaching the base just as the next wave of people were beginning their ascent. After spending some time wandering through the areas of Machu Picchu we hadn't ventured into the day prior, we decided to head down the mountain for lunch, reaching the bus stop just as another downpour began. We couldn't have had better timing! The rest of the day was spent in Aguas Calientes, enjoying a leisurely lunch and people-watching through the rain before each of us departed on our trains, back to Cusco. Companions in exploration - Q, Christina, Laure, and Matthew. The entire experience was amazing beyond words - challenging, yes, but I couldn't imagine a more rewarding way to visit Machu Picchu. And the trek not only allows you to visit Machu Picchu, but the dozens of other ruins along the way, the incredible views, the unique plantlife, slowly building over the course of days, while pushing yourself physically, and culminating in that first glimpse from afar of the radiant Inca city. These pictures are absolutely breathtaking... there are no words. It almost looks like you're standing in front of a green screen! :) I am so happy for you, and I can see why you left our 3.5 sad gray cube walls, haha. Thank you so much! 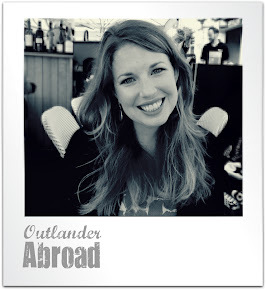 I'm so flattered - I'm sure you can do the Inca Trail soon as well! 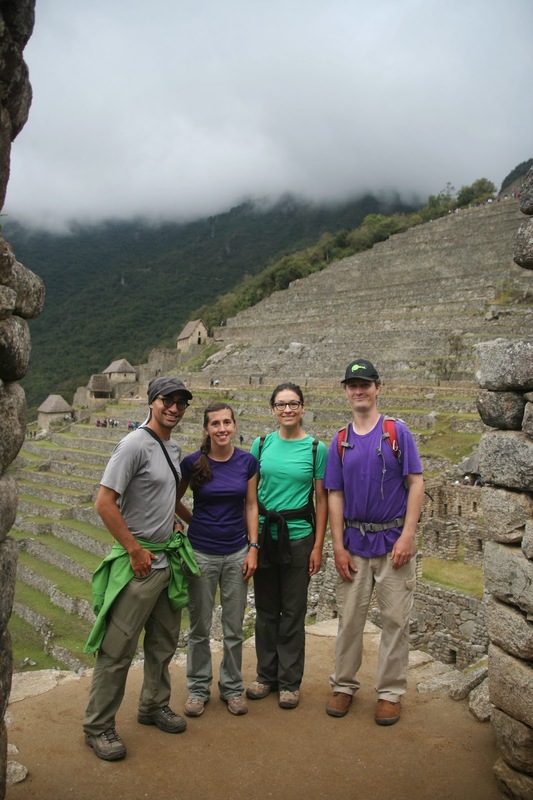 Just make sure to book well in advance if you want to do the actual Inca Trail - there are plenty of alternatives you can book more last-minute though! Into bounce houses your children's get lot of fun with boundless energy. Inside this your child's are given a free pass to jump, crawl, slide and bounce. Check out an inflatables rentals company which often have inflatable fun along with slides.